LFP Publisher Kim Richter's Son, Sterling Does Street Wrap Art On Granville & Nelson St.
More info coming tomorrow. 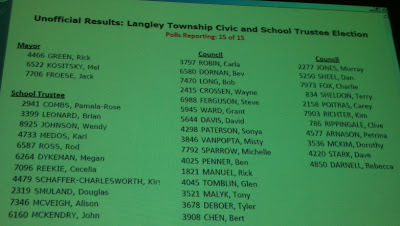 Thank you to Joe Zaccaria for sending the photo of the final election results above. For FULLSCREEN select bottom left button above & to SHARE select button to it's left. PLEASE SHARE! This LFP Editor has just had enough of the Green VLN slate-mates in unison parroting their ridiculous deception attempt trying to convince us that they are Independents yet also a Slate! It becomes even more ludicrous when they line up and repeat this one after another at every debate. So I decided to finally highlight and point out this inane Green VLN slate attempt to word craft and word weave this B.S. 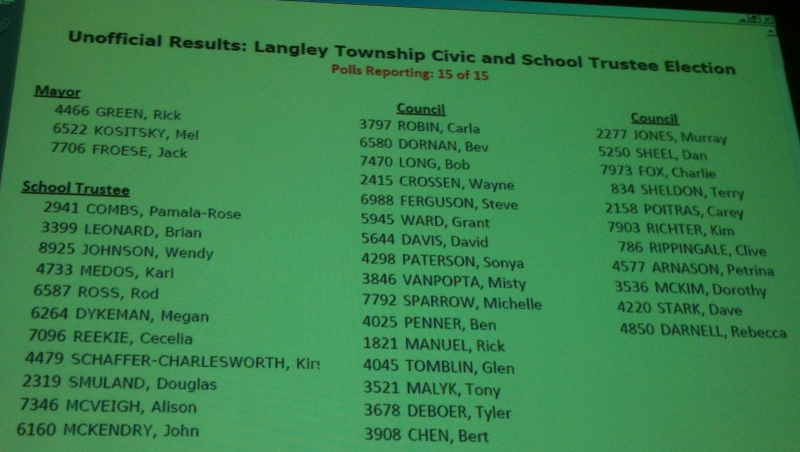 to us, the Langley Township voters, in the above very short 47 second video. I hope you find it as amusing as I did. Banquet Hall at Langley Events Ctre. At last night's last election event at the Langley Event Center which by-the-way the Green VLN Slate and slate-mates continually criticize, the Langley Township Election candidates had their final public hurrah before this Saturday's election. One by one they introduced themselves and there after mingled with the audience answering individual questions. This event was organized by an election candidate herself, Sonya Paterson. Good job Sonya. Unfortunately there were far too many empty audience seats. I'm told that the poor weather may have been the issue. There was even a Gang-Green anti-slate protester in attendance who parodied the Gang-Green slate's red stop sign ads. Well known anti Gang-Green VLN slate critic Suhki Dhami wore a sandwich board imprinted with our own LFP designed Rick Green anti-slate stop sign. He downloaded this from LFP and had it blown up onto the sandwich boards. Very creative Suhki. 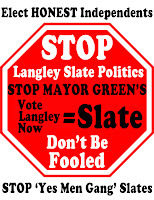 Share your opposition to Municipal slates, especially Langley Township's Rick Green Slate! Print, Share or Email this posting to your own lists of Email, Facebook, Twitter, Blog, etc. friends. At the bottom left side of this LFP Posting are convenient and simple buttons to automatically Email, Blog, Facebook and Twitter to your friends to more easily share this LFP Posting. Anyone & everyone can then get their own copy of this Langley Anti-Slate Poster to proudly display where you stand on slates. Get your own poster by clicking on this following link: "I Don't Want Slates In Langley!" Then simply print it out (use keyboard Ctrl & P to print it out after clicking the link). Print it in either colour or B&W. This same poster link is also available on this LFP sidebar on the upper left sidebar by clicking the STOP SIGN and then keyboard Ctrl & P to print it out. This poster/flyer prints out on a full 8.5 x 11 inch standard sheet of paper. If you want, maybe even consider a local printer to get hundreds of flyers or posters! Keep in mind that the deadline is election day this Saturday & the last candidates meet & greet debate is tomorrow night at Langley Events Center! Bring lots of flyers! Langley Township School Trustee Candidate Megan Dykeman Featured On CBC National News: "Putting on the Glitz"
Langley beauty pageant makes the national news! Watch Langley Township School Trustee Candidate Megan Dykeman (running for election this Saturday) who was featured on last night's CBC National News (November 13, 2011) : "Putting on the Glitz" . Mouse Clik "Putting on the Glitz" to view it. The Langley Township Firefighters after extensive research officially published their list that they support for council in Langley Township.Their 4'x8' signs pictured here were sprouting up throughout the Township. In addition the Firefighters are expected to advertise in the local newspapers as well as drop literature throughout the Township. Before they came to their conclusion the Firefighters had questionnaires that all candidates answered. They also hosted a debate where all the candidates were able to provide their credentials/policies and they also answered pre-prepared questions that they all got in advance. No ambush there unlike at the three community group's so-called pro Green VLN debate. In addition all the candidates were able to mingle-meet-greet the firefighters and guests at that debate. All the council incumbents except for Councillor Bev Dornan and incumbent Mayor Rick green were endorsed. The Firefighters instead endorsed Mel Kositsky for the Mayor position. New candidates Rebecca Darnell, Michelle Sparrow & Dan Sheel were also endorsed. Who's Really Playing Dirty Politics? Inappropriate & a Totally Rick Green VLN Partisan Candidate Ambush At Tonight's Mayor Debate By Debate Organizers! Last night's debate was hosted by three groups: Salmon River Enhancement Society, The Fort Langley Community Association and the new Yorkson Community Association. There are no words to adequately describe this Editor's disgust at the travesty pretending to be a genuine and legitimate Mayor's Candidate debate held at the Brookswood Secondary school gym. The debate was promoted as a non partisan forum to hear the views of the three Langley Township Mayor candidates on legitimate community concerns: the environment, development and community input to council decisions. The reality was far removed from this description. The event was not a debate but a "Rick Green VLN love-in" by very partisan debate organizers. While the beginning was innocuous enough with opening statements from the three Mayor candidates, it rapidly disintegrated into a "bash Mel Kositsky and Jack Froese" session as evidenced by the questions posed by the event organizers themselves and their partisan supporters. Every question asked was designed to showcase Rick Green at the expense of Mel and Jack. How sad that legitimate community groups would allow their credibility to be so badly damaged. As a small sample watch the following video. Watch all 3 Videos of Councillors Richter, Fox & Ferguson below here in this LFP posting. These three Councillors had the most significant Council responses to Cllr. Grant Ward's Motion calling for a formal Committee of Inquiry into the complete Mayor Green Brownshack Affair. Mayor Green's response was his standard deflection and attempts to ignore the facts. "The Lidstone Report concluded the Mayor misled several times. The Mayor misrepresented and his actions were dishonest. "Had the Mayor been honest from the outset, not one dime and not one minute of legal time would have been spent on this matter. ...This matter needs to be left with the electorate for final resolution." 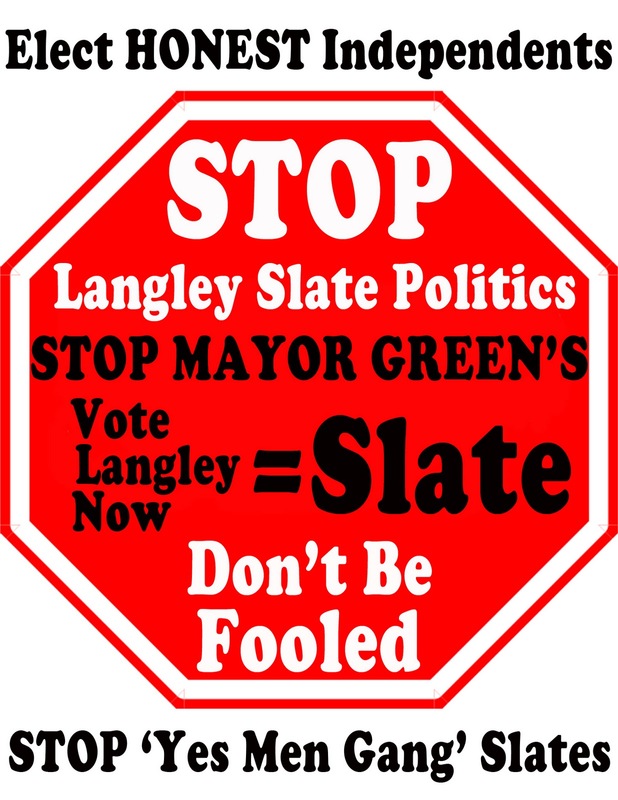 Why is Mayor Green & his VLN Slate attacking the Langley Events Center? Mel Kositsky Kicks Off Mayoralty Campaign - Says: "This election is all about trust. The trust... has been broken. It can never be repaired." Sunday Oct 30Th at 1 PM and for the rest of the afternoon many people wandered in and out of Councillor Mel Kositsky's new Walnut Grove campaign office on it's grand opening to which the public and politicians at large were invited to. Mel is hoping to beat the rookie Incumbent Mayor Rick Green and the political newcomer/challenger Jack Froese to become the next Mayor of Langley Township in what could well be a tight 3 way race.